Do not miss this spectacular Indiana Destination! We can offer a variety of menus to suit guests taste and your budget or we can customize a menu especially for your bus tour group. Our professional staff will help you plan your event down to the last details. 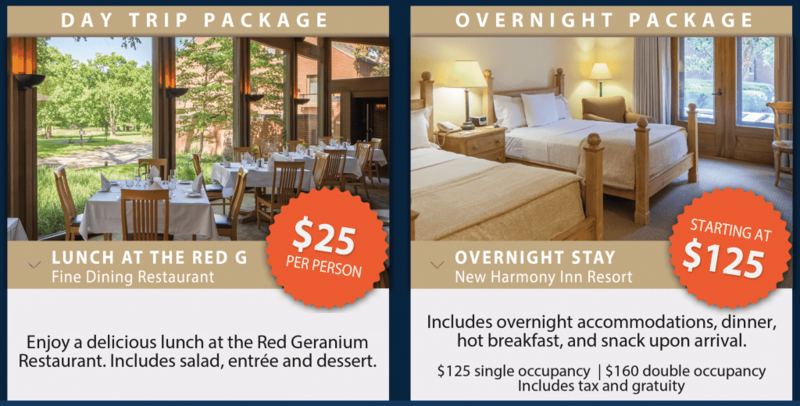 Your visit to the New Harmony Inn Resort and Conference Center will be an unforgettable experience for your guests. 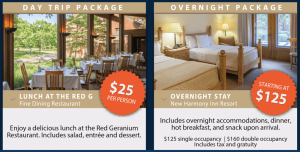 Day Trip – Enjoy a delicious lunch at the award-winning Red Geranium Restaurant. Includes salad, entree and dessert. $25 per person, all inclusive. Bus Tour Group Overnighter – Includes overnight accommodations, dinner, hot breakfast the following morning, and a snack upon arrival. Starting at $125 per person, all inclusive. Contact us today to host your upcoming bus tour groups and experience utopia for yourself!